A summer must-have. Serve with corn on the cob and some crusty grilled bread to round it all out. 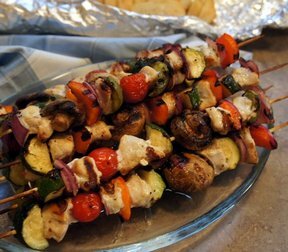 Soak skewers in water for at least 30 minutes prior to grilling to prevent burning. In a large ziploc bag, combine olive oil, soy sauce and steak seasoning. Add steak and refrigerate for 1 hour. In a separate ziploc bag, place vegetables and the italian dressing. Refrigerate until ready to use. 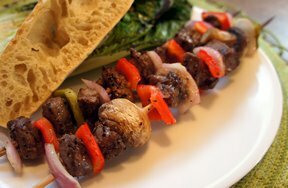 Begin to assemble kebab alternating meat, onions and pepper, leaving a small amount of space between each item. 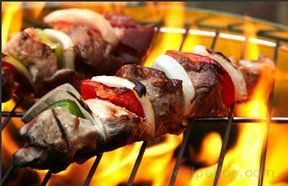 When ready to grill, place the skewers on the grill grate, keeping each skewer 1 to 2 inches away from the next skewer. 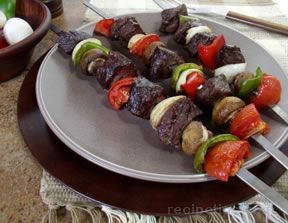 Allow the kebabs to cook for several minutes on each side turning them 2 to 3 times to cook all surfaces. "Don't forget the mushrooms! I add them right in with the other veggies. Zucchini is also a great addition. The longer the vegetables marinate, the better. I usually get them ready in the morning. Meat gets salty if you marinate for longer than an hour."